Adams County Habitat for Humanity thanked the Adams County Commissioners who then recognized the work of the nonprofit in providing much needed low income housing in the region. Left to right: Commissioner James E. Martin, Bill Scott ACHFH Board member, Commissioner Randy I. Phiel, ACHFH Board President and Senior Vice President/ACNB Bank Pete Ricker, Commissioner Marty Karsteter Qually, and ACHFH Board member and REMAX Real Estate Agent Sue Pindle. 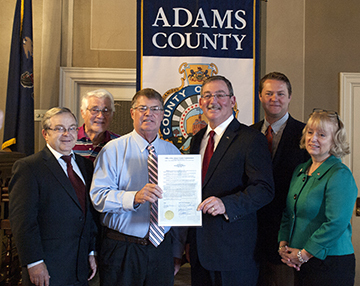 GETTYSBURG, PA (May 25, 2016)— The Board of the Adams County Habitat for Humanity thanked the Adams County Commissioners for their continued support for the construction of homes for deserving families in Adams County. On March 23, the Commissioners approved a grant for the Adams County Habitat for Humanity, funding they have approved since 1999. ACHFH Board members attended the commissioners meeting Wednesday, May 25 to thank them and underscore the need for affordable housing in Adams County. The Adams County Housing Committee reviews grant requests and makes recommendations to the Commissioners for allocation of funding from the Affordable Housing Trust Fund, which is set aside for projects that serve low to moderate income people. “Using this funding source, the County has been able to assist in providing much needed affordable housing to people who otherwise would not have quality affordable housing,” Anne Thomas, Grants Coordinator, Adams County Planning & Development. The grant to ACHFH was targeted to “support the development of three single-family detached residences in Biglerville Borough for any Adams County income qualified households.” Combined with other donations and support from local churches, businesses, groups and individuals, Adams County Habitat for Humanity makes it possible for qualified partner families to have the benefits of home ownership. This spring 2016, Adams County Habitat for Humanity completed its 38th home and is in the planning stages for the next. To offer professional services or donate supplies, please contact Adams County Habitat at 717-334-5557 or habitatadamspa@yahoo.com. All donations are tax-deductible—the organization is a 501 (c) (3). To volunteer with Adams County Habitat for Humanity, contact volunteer committee chair Bob Remaley at coachremaley@comcast.net. For more information, check the Adams County Habitat for Humanity Facebook page at www.facebook.com/adamscountyhabitat or the website at www.habitatadamspa.org or call 717-334-5557.